This article is about the Myers-Briggs personality type. For the Socionics INFj, see Ethical Intuitive Introvert. INFJ (Introversion, Intuition, Feeling, Judging) is an initialism used in the publications of the Myers–Briggs Type Indicator (MBTI) to refer to one of the sixteen personality types. The MBTI assessment was developed from the work of prominent psychiatrist Carl Jung in his book Psychological Types. Jung proposed a psychological typology based on the theories of cognitive functions that he developed through his clinical observations. From Jung's work, others developed psychological typologies. 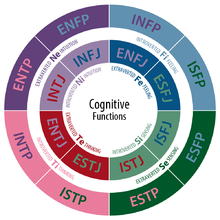 Jungian personality assessments include the MBTI instrument, developed by Isabel Briggs Myers and Katharine Cook Briggs, and the Keirsey Temperament Sorter, developed by David Keirsey. Keirsey referred to the INFJs as Counselors, one of the four types belonging to the temperament he called the Idealists. INFJs are the rarest type, and make up about 1–3% of the general population. INFJs are conscientious and value-driven. They seek meaning in relationships, ideas, and events, with an eye toward better understanding themselves and others. Using their intuitive skills, they develop a clear and confident vision, which they then set out to execute, aiming to better the lives of others. Like their INTJ counterparts, INFJs regard problems as opportunities to design and implement creative solutions. INFJs are believed to adapt easily in social situations due to their complex understanding of an individual's motivations; however, they are true introverts. INFJs are private individuals who prefer to exercise their influence behind the scenes. Though they are very independent, INFJs are intensely interested in the well-being of others. INFJs prefer one-on-one relationships to large groups. Sensitive and complex, they are adept at understanding complicated issues and driven to resolve differences in a cooperative and creative manner. INFJs are deeply concerned about their relations with individuals as well as the state of humanity at large. They are, in fact, sometimes mistaken for extroverts because they appear so outgoing and are so genuinely interested in people—a product of the Feeling function they most readily show to the world. INFJs are said to have a rich, vivid inner life that they may be reluctant to share with those around them. Nevertheless, they are congenial in their interactions and perceptive of the emotions of others. Generally well liked by their peers, they may often be considered close friends and confidants by most other types; however, they are guarded in expressing their own feelings, especially to new people, and tend to establish close relationships slowly. INFJs may "silently withdraw as a way of setting limits" rather than expressing their wounded feelings—a behavior that may leave others confused and upset. According to Baron and Wagele, the most common Enneagram of Personality enneatypes that statistically correlate to INFJ are the Four, One, and Six enneatypes. At work, the INFJ is focused on the task of bettering the human condition. INFJs are dedicated, helpful, and principled workers who can be relied on to envision, plan, and carry out complex projects for humanitarian causes. INFJs are typically organized and prefer work that allows them to complete projects in an orderly manner. They are often independent and tend to prefer a quiet environment that allows them the opportunity to fully develop their own thoughts and ideas. Besides, INFJs have extremely high expectations of themselves and sometimes others. The ideal work environment for an INFJ is harmonious, industrious, and oriented to a humanitarian mission, with co-workers who are similarly committed to positive change. This desire to help and connect makes the INFJ more qualified for careers in Healthcare, especially the more holistic varieties, very rewarding for INFJs – roles as counselors, psychologists, doctors, dentistry, life coaches and spiritual guides are all attractive options. The ideal job for a Counselor allows them to use their creativity in an independent, organized environment to develop and implement a vision that is consistent with their personal values. INFJs often pursue expressive careers such as writing, elegant communicators that they are, and author many popular blogs, stories and screenplays. INFJs are clever, and can function in any of these fields, but to be truly happy, they need to be able to exercise their insightfulness and independence, learn and grow alongside the people they are helping, and contribute to the well-being of humanity on a personal level. Attracted to symbolic action or devices. Ni synthesizes seeming paradoxes to create the previously unimagined. These realizations come with a certainty that demands action to fulfill a new vision of the future, solutions that may include complex systems or universal truths. Fe seeks social connections and creates harmonious interactions through polite, considerate, and appropriate behavior. Fe responds to the explicit (and implicit) wants of others, and may even create an internal conflict between the subject’s own needs and the desire to meet the needs of others. Ti seeks precision, such as the exact word to express an idea. Ti notices the minute distinctions that define the essence of things, then analyzes and classifies them. Ti examines all sides of an issue, looking to solve problems while minimizing effort and risk. Ti uses models to root out logical inconsistency. Se focuses on the experiences and sensations of the immediate, physical world. With an acute awareness of the present surroundings, it brings relevant facts and details to the forefront and may lead to spontaneous action. Weak Se in the INFJ may result in a detachment from the sensory reality, but when the function is in use it adds a playful counter to the serious nature of Ni. Extraverted intuition (Ne): Ne finds and interprets hidden meanings, using hypothetical questions to explore alternatives, allowing multiple possibilities to coexist. This imaginative play weaves together insights and experiences from various sources to form a new whole, which can then become a catalyst to action. Introverted feeling (Fi): Fi filters information based on interpretations of worth, forming judgments according to criteria that are often intangible. Fi constantly balances an internal set of values such as harmony and authenticity. Attuned to subtle distinctions, Fi innately senses what is true and what is false in a situation. Extraverted thinking (Te): Te organizes and schedules ideas and the environment to ensure the efficient, productive pursuit of objectives. Te seeks logical explanations for actions, events, and conclusions, looking for faulty reasoning and lapses in sequence. Introverted sensing (Si): Si collects data in the present moment and compares it with past experiences, a process that sometimes evokes the feelings associated with memory, as if the subject were reliving it. Seeking to protect what is familiar, Si draws upon history to form goals and expectations about what will happen in the future. ^ "Personality Type Distribution in the General Population". careerplanner.com. Retrieved July 20, 2018. 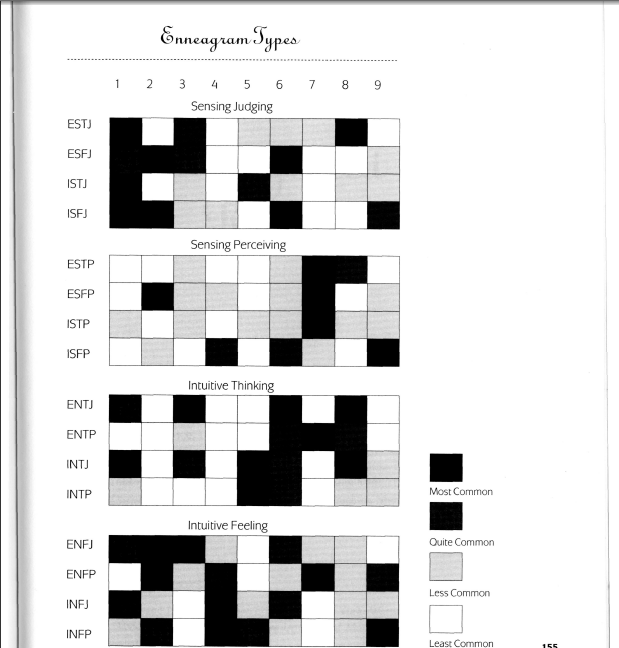 ^ "The Myers & Briggs Foundation - The 16 MBTI® Types". www.myersbriggs.org. ^ "Keirsey Temperament Assessment". Keirsey Temperament Assessment. ^ Baron, Renee (1998). What Type Am I: Discover Who You Really Are. New York, NY: Penguin Books. p. 141. ISBN 978-0140269413. ISBN 0-1402-6941-X. ^ Reardon, Christin M. (June 2009). "DIFFERENCES IN MYERS-BRIGGS PERSONALITY TYPES AMONG HIGH SCHOOL BAND, ORCHESTRA, AND CHOIR MEMBERS" (PDF). Jacobs School of Music, Indiana University. Retrieved July 5, 2014. ^ "INFJ Personality Type — The Confidant". Personality Max. Retrieved Feb 3, 2016.